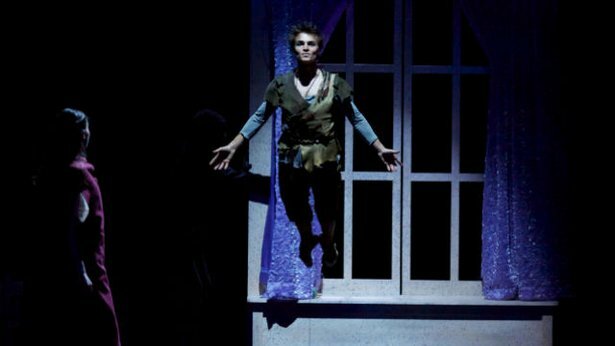 Peter Pan from the Milwaukee Ballet premiered April 14, 2014. Enjoy J.M. Barrie’s story in Michael Pink’s adaptation performed by Milwaukee Ballet. Choreographed by Milwaukee Ballet Artistic Director Michael Pink, Peter Pan From the Milwaukee Ballet took the city by storm, playing to sold-out houses and earning standing ovations nightly. Featuring an original score from British composer Philip Feeney, this impressive stage show features dancers flying high over the action and a looming, full pirate ship that sails across the stage. MPTV spent months recording performances of Peter Pan and producing the piece for broadcast, under the direction of Emmy Award-winning producer/director Phillip Byrd. The ballet features Leading Artist Marc Petrocci as the iconic Peter Pan and rising star Valerie Harmon as Wendy. The production also boasts a top-notch creative team, including Emmy Award-winning lighting designer David Grill. Peter Pan from the Milwaukee Ballet is part of the ongoing, multi-platform “PBS Arts” initiative, which highlights PBS’s commitment to the performing and visual arts, and gives millions of viewers a front-row seat and a backstage pass for the best music, theater, dance, art, and cultural history programs on-air and online. Milwaukee Public Television is southeastern Wisconsin’s premiere non-commercial media organization. MPTV consists of two traditional television stations, WMVS and WMVT, and seven additional digital television services. The MPTV stations are the area’s only over-the-air source for PBS and other national public television programs, and also offer a diverse schedule of their own award-winning local series and specials. Each week, over 900,000 viewers throughout southeastern Wisconsin and northern Illinois watch MPTV. Founded in 1970, Milwaukee Ballet strives to inspire its audiences to think within and beyond traditional ballet through the presentation of quality performances and the implementation of educational opportunities. Milwaukee Ballet and Milwaukee Ballet School & Academy are recognized among the top companies in the nation. Milwaukee Ballet School & Academy is the only professional dance school in the Midwest accredited by the National Association of Schools of Dance. With an annual operating budget of more than $5.5 million, Milwaukee Ballet presents more than 40 performances to more than 50,000 people each year. Its resident company includes 25 professional dancers along with 20 trainees in the Nancy Einhorn Milwaukee Ballet II Program and is one of the few dance companies in the country to maintain its own symphony orchestra. Milwaukee Ballet School & Academy, the official school of the Ballet, has an enrollment of nearly 1000 students at three locations throughout Southeastern Wisconsin. Milwaukee Ballet’s Community Outreach programs are offered year-round through hands-on workshops, original children’s productions and a student matinee series serving over 30,000 people each year. Additional funding was provided by Anne Ray Charitable Trust and Wisconsin Energy Foundation.